By Dr. Michael Vaezi, MD, PhD, MS, Clinical Director of the Center for Swallowing and Esophageal Disorders at Vanderbilt University Medical Center. Dr. Vaezi also serves as on the Medical Advisory Board for the Achalasia Foundation. Achalasia, a rare condition affecting about 1 in every 100,000 individuals each year, is defined as a disorder of the esophagus in which the band of muscle located where the esophagus and stomach meet fails to function properly. This muscle is called the lower esophageal sphincter (LES) and it typically relaxes when a person swallows. However, in people diagnosed with achalasia, the LES does not fully relax and the normal muscle activity of the esophagus is reduced. Therefore, food is not properly moved through the esophagus to the stomach. Classic symptoms of this disorder include difficulty swallowing foods and/or liquids (dysphagia), as well as regurgitation of undigested foods and saliva. Additional symptoms may include substernal (esophageal) chest pain during meals, significant or rapid weight loss, and significant reduction in overall quality of life. Achalasia occurs equally in men and women, typically between the ages of 30 and 60, has no racial predictor, and does not run in families. Achalasia may be suspected based on symptoms, but tests need to be performed to confirm the diagnosis. 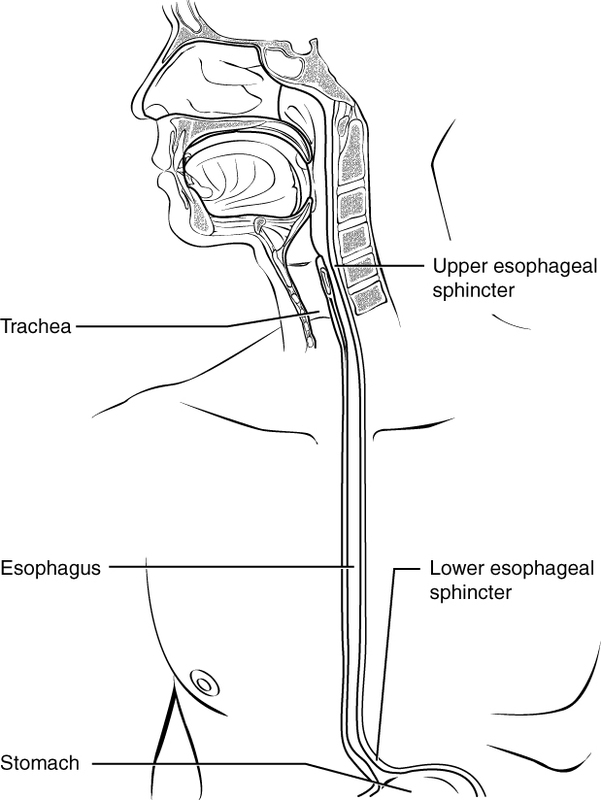 Assessment of esophageal motor function is essential for accurate diagnosis of achalasia. This assessment is accomplished through esophageal motility testing. Other tests that may be performed in patients experiencing achalasia symptoms include barium esophagram (x-ray swallow test) and esophagogastroduodenoscopy (EGD), which is done with a scope. However, neither of these tests done alone is sensitive enough to achieve a definitive diagnosis. This video show a patient with achalasia. SwallowingDiagnostics.com gave us permission to share this video for educational purposes. Although there is no cure for achalasia, there are options available to patients in the management of their symptoms. It is important for patients to understand that none of the available treatments are expected to restore normal contractions in the esophagus but are designed to weaken the LES muscle to the point that is no longer prevents the passage of food into the stomach. The three primary treatment options for patients with achalasia include drug therapy, balloon (pneumatic) dilation (stretching), or surgery. Drug therapy — Oral pharmacologic therapies are the least invasive option for treating achalasia. Calcium channel blockers and long-acting nitrates are the two most common medications used in the treatment of achalasia because they have LES muscle-relaxing effects. These drugs may decrease patient symptoms, but many people find that long-term pharmacologic therapy is ineffective and is often associated with unpleasant side effects such as headaches, low blood pressure (hypotension), and swelling of the feet. Additionally, the medications may become less effective over time. Therefore, drug therapy is usually only recommended for patients who are not healthy enough or do not wish to have other treatment options. Botulinum toxin (Botox) injection — Botulinum toxin injections temporarily paralyze the nerves that signal the LES to contract. The procedure is performed during endoscopy, while the patient is sedated and the botulinum toxin is injected through the lining of the esophagus directly into the LES muscle. Most patients (>75%) realize symptom relief in the first month following the injection, and 35 to 41% of patients still experience benefit twelve months after the initial injection. However, the therapeutic effect eventually wears off and repeat injections are often required in a significant portion of patients. Botox injection is more likely to be effective in older patients and in those who have a vigorous form of achalasia. Vigorous achalasia is typically characterized by pain described as sharp, cramping, and spasmodic in nature, usually in the esophageal and epigastric regions and often referred through to the back or up the base of the neck and ears. Importantly, the use of Botox injection into the LES may increase the difficulty in performing a surgical myotomy in the future. Balloon dilation (pneumatic dilatation) — Pneumatic dilation (PD) is the most effective non-surgical option for patients with achalasia, however, all patients who undergo this procedure must be candidates for surgical intervention in the event that an esophageal perforation occurs and requires surgical repair. This only happens in 0 to 16% (average = 1.9%) of patients undergoing PD. During PD, an endoscopic-guided balloon is passed through the esophagus and placed at the LES. Air pressure is increased in the balloon to weaken the LES by tearing its muscle fibers through generating radial force. The balloons come in three different sizes (3.0, 3.5, and 4.0 cm) and research suggests that using the graded dilator approach (smallest to largest), good to excellent symptom relief is achieved in 50 to 93% of patients. Utilizing the graded dilation approach may also decrease the rate of perforation. A small study revealed that graded dilation resulted in symptom improvement in 90% of patients six months after the procedure and in 44% of the patients six years following the procedure. The success rate after longer periods has not been well studied, but some people have remained symptom-free for as long as 25 years. Surgery (myotomy) — Myotomy is an operation that is used to weaken the LES by cutting its muscle fibers. The most common surgical technique used to treat achalasia is called the Heller myotomy, in which the surgeon cuts the muscles at the end of the esophagus and at the top of the stomach to relieve difficulty swallowing. This surgery is usually performed laparoscopically, using instruments and a camera that are passed into the abdomen through five small abdominal incisions. People who undergo laparoscopic myotomy are given general anesthesia, and may stay in the hospital for one to two days. Research has shown that this surgical procedure relieves symptoms in 89% of patients at six months following the surgery and in 57% of the patients after six years. Some studies suggest that symptom relief may be sustained in as much as 65% of people 20 years after the surgery. For these reasons, some consider surgery to be the more definitive treatment for achalasia as compared to balloon dilation or Botox injection. Because none of the treatments for achalasia result in the cure of the disease, regular follow-up is needed. The goal is to recognize and treat recurrent symptoms or complications of treatment as soon as possible to prevent or minimize the chance of other problems developing as a result of the disease. Your healthcare provider is the best source of information for questions and concerns related to your medical problem. How come POEM surgery is not listed? Hi Kim – Great Question! POEM, or peroral (through the mouth) endoscopic myotomy, is another surgical option for patients with achalasia. Rather than being a laparascopic option, the POEM is an endoscopic surgical option. For more information on POEM, please click here. My sister has undergone the POEM procedure and the myotomy. The POEM was done a couple months ago and she had complications (tears). She has recovered and was doing better but the past few weeks she has been having problems again (can’t keep any food/water down). Are there any other options available? I was diagnosed with achalasia about 3 years ago and have had 6 balloon dilatations to date. In the past 8 weeks I have only been able to drink prescribed high protein drinks from dietician/GP. Consultant wants to do another dilatations, but I am not keen. Eating is anything but pleasurable. Can I survive with all the nutrients I need just by having prescribed drinks and other fluids? Consultant not keen to do Hellers Myotomy because of other medical problems. I am 53 year old , female. The Oley Foundation, a non-profit with whom we work closely and supports people living on a feeding tube recently had an article about a feeding tube patient celebrating 40 years on an oral diet via a feeding tube. With the right liquid nutrition, one that is vetted by a qualified nutritionist or dietician for nutritional balance, one can live on a liquid diet indefinitely. This is far from ideal and has major social implications, but the proper nutritional formulas can provide the body the nutrition needed to survive.